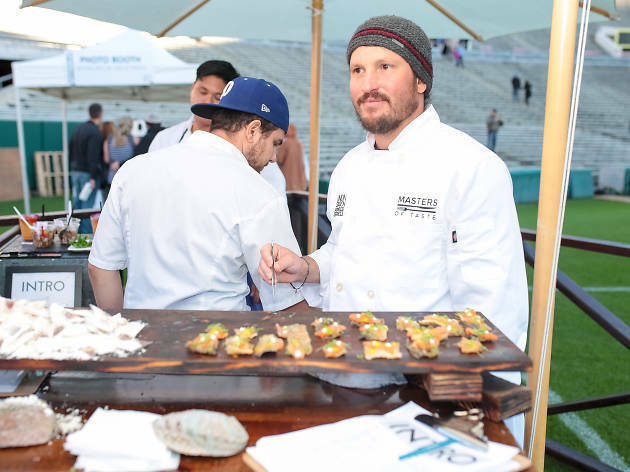 Luxury food fest Masters of Taste is back for another year at the Rose Bowl with some of L.A.'s finest bars, restaurants and dessert shops. Participants include Salazar, Faith & Flower, Momed, Lunasia Dim Sum House, Ramen Tatsunoya, Wax Paper, the Raymond 1886 and more, with sweets from Porto’s and Lady M, among others. A 5-star event indeed! Masters of Taste is a foodie's paradise where you'll get the best selection of food, drinks, and dessert. I went this past weekend, and it was probably the best event I've ever gone to food related. There are well over 50 vendors from classic desserts to upscale fancy small bites. The best part is that the tastings are unlimited and you'll certainly eat your fill! One of the downsides was the weather as at one point, it started to pour! The event was all outdoors but eventually the sky cleared up. The vendors were so nice to get to know as we tried out all their different items. Because of this event, I certainly find some good eats I'm hoping to try out for lunch and dinner. Masters of Taste was a mecca for foodie events, and am so glad I had a chance to partake on it! This was a fabulous way to spend a Sunday afternoon. Basically there is no better way to sample the cuisine of the various L.A. eateries, than this event which featured small plates and cocktails from probably around 100 different restaurants/bars.Nothing disappointed, and even though there was the occasional long line, it was still very well managed and arranged. In the middle of the day there was a random torrential downpour, but once the storm passed, the grubbing continued as usual. The only better thing the event could have done would have been to erect tents to keep the crowd dry. But rain is always the last thing Los Angelenos expect :) The ticket prices are a bit steep, but for the amount of food and alcohol offered, it's worth it. My only disappointment was not being able to try everything since I was way too full. All in all, a great event!